The only gifts we’ve ever had appear on our doorstep are pineapples, and both have been left by givers unknown in the past month. About three weeks ago we returned home to discover a medium-sized pineapple, a variety that is very juicy but also a bit tart, sitting on our doormat. No card, no message, no hint of who left it. No wanting to waste a perfectly good pineapple, Tawn decided he would make pineapple fried rice. While you don’t see it much in my blog, Tawn actually cooks and is quite proficient. When we lived in the United States and he was going to school, he prepared a lot of our dinners. Since we’ve moved to Thailand, I do most of the dinner preparation so you have precious few opportunities to see his culinary skill. Let me use this opportunity to fix that. Iron Chef Tawn, armed and ready to cook. 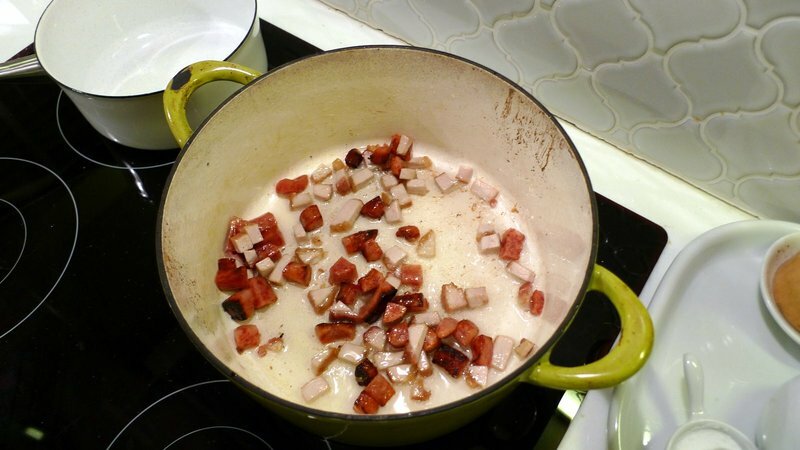 First off, fry some Chinese sausage. Once starting to brown, add some crispy pork and fry for another few minutes. 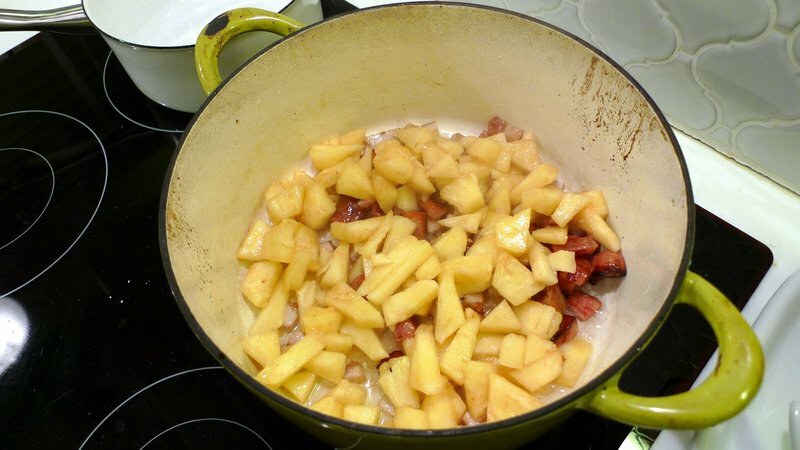 Add the pineapple and fry for a few minutes until it begins to brown slightly. Add rice. We like using whole-grain rice cooked the night before. 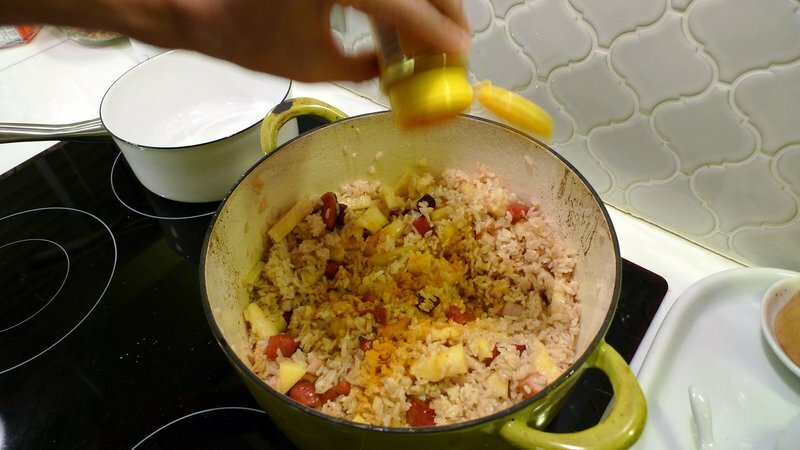 Mix rice into other ingredients on high heat. Add turmeric. You can add other spices if you wish to customize the flavor. Once almost finished, add some raisins. We added some pine nuts, too. Finished dish, carefully plated to look like a pineapple. Very tasty weekday evening treat. This week’s champion: Iron Chef Tawn! Awesome! It looks really tasty, and easy enough for even me to pull off. ^o^ Yay~~~I luv how it was plated. That’s something my food REALLY lacks… presentation. Lol. I smiled at the presentation – very nice way of showing off the food. Looks simple enough that even I could make it (and that’s saying something.) Very nice! that looks incredible. very talented! LOL I love the Iron Chef references. That show is AMAZING! The plating is very adorable and that dish looks great! Tawn can cook!! I think I’ll have to make this some time soon. I happen to be a fan of the cooked pineapple and the raisins (ooh the raisins) send me! I made some Sabudana the other night and it was perfect (after I added the raisins)! Interesting, wouldn’t have thought of adding pineapple. I guess it sorta like adding pineapple to pizza, so it has to be pretty tasty! Wow that looks like a beautiful tasty dish! Who is Tawn to you? Is he related somehow? That’s a good idea. I have a pineapple sitting on the kitchen counter for a week. 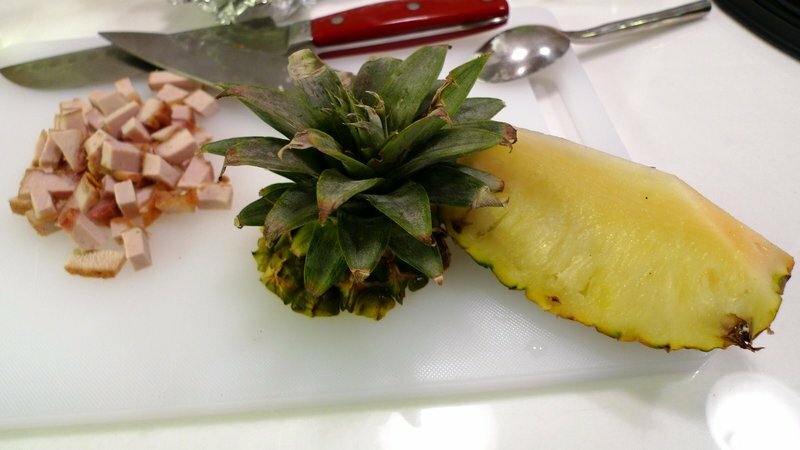 Time to make pineapple fried rice now. 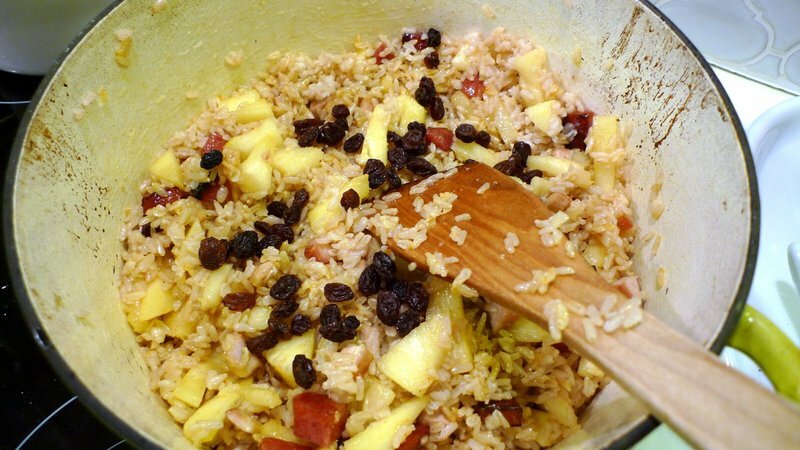 I really like pineapple fried rice… send some over? Ooh — that looks delicious! The Mystery of the Pineapple on Soi 53. Maybe it was divine intervention?I was thinking of making pineapple (canned) and ham fried rice. I’ve never thought of adding raisins and tumeric. btw – when I cook, there’s usually a mess with food, oil, sauces all over the place. I don’t think I’ve ever seen a spill or a stray food particle. Another mystery… hee hee. Oh yum and that looks wonderful. It looks so delicious, Tawn. Perhaps you’ll do us the honors on our next visit (whenever that is). I have tried the recipe and love it. But your cook looks much better or should I say more handsome than mine – me!!! That looks very simple and delicious! I don’t know if I would be brave enough to cook and eat fruits of unknown origins, but more power to you! Oooh, I love pinapple rice. You just gave me an idea on what to do with my pineapples from Chinese New Year! Ah, pine nuts is one of my favourites too! It’s nice to see a reversal of roles this time around. I hope to see more of that in the future? Very cute presentation :)I have never seen raisins and pine nuts in it before — is that Tawn’s innovation, or are those ingredients often used in Thai fried rice? 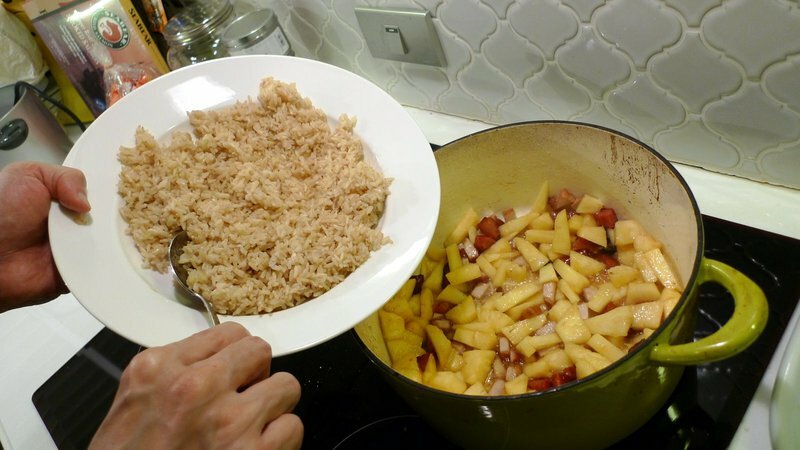 Ooo, I hope you get more random pineapples!I’ve never thought about putting fruit in with fried rice but this looks lovely. Good job, Tawn! yum. i want some of that! Yay for Tawn! I have never eaten pineapple fried rice. It looks great. Perhaps your neighbours thought that Tawn is Chinese(?) and left the pineapple as a Chinese New Year gift ? I heard that pineapples are always eaten during the Chinese New Year, to bring luck and prosperity. That’s what I have HEARD! @CurryPuffy – It happense more often than I write about it, actually. @ZSA_MD – Well, Tawn’s grandfather was Chinese so there is some truth to that. I’m sure it was left by one of two neighbors, either an older Thai couple on the 8th floor who used to live and work in the US with whom we visit from time to time, or else a younger doctor friend of his who lives in the adjacent building. @rudyhou – C’mon over! @TheCheshireGrins – Yeah, random pineapples! 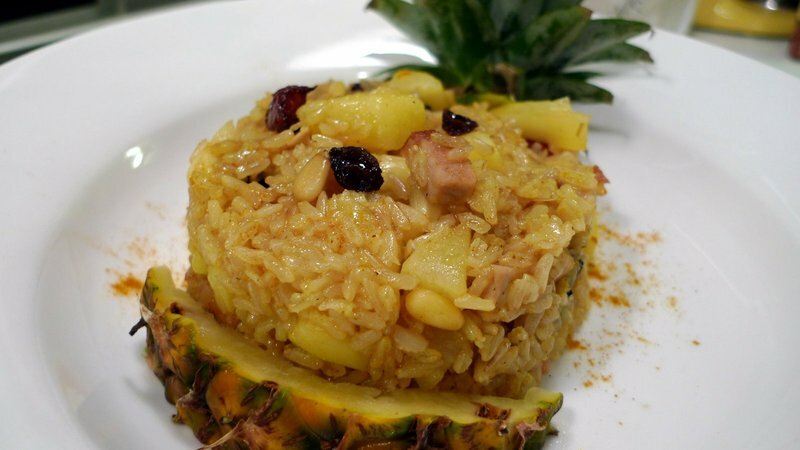 @Senlin – The pine nuts are random but I think the raisins are pretty common in Thai style pineapple fried rice. How are you, by the way? I’ve missed you. That looks so delicious! I think I would be in heaven!! 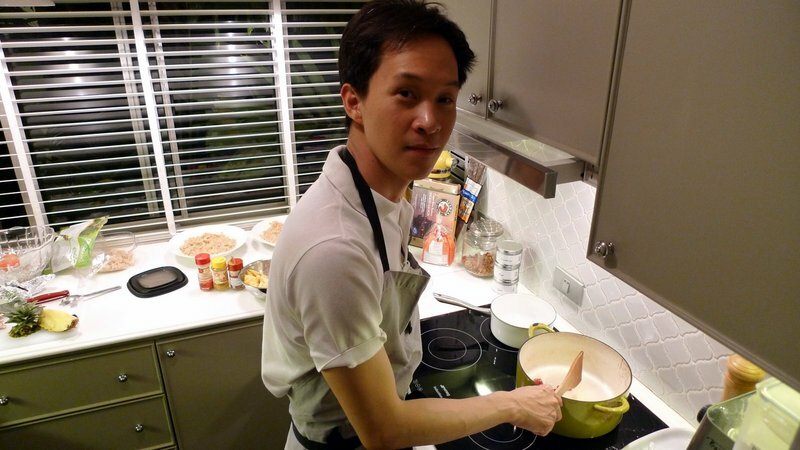 @christao408 – Right now, I just cook for other people. I don’t eat much. They’re no flavor to me.